We, The Save the Goshen School House Committee, an organization of volunteers are working towards raising monies to restore one of the oldest schoolhouses in Cape May County; the Goshen School is significant for its association with the mid-nineteenth century development of public education in New Jersey. The school was built in 1872 and used as a school until 1962. Unfortunately the building has been neglected and is need of repair. We have successfully raised funds which were required to match a $30,000.00 grant through the New Jersey Historic Trust. We have applied for an Emergency Structural Stabilization grant for $176,884.00, also through the New Jersey Historic Trust; matching fund responsibilities are unknown as of our application is in progress. Total costs for the preservation is estimated to be $860504.00. We are currently planning our second Spaghetti Dinner to be held at Steve's Café located on Route 47 in Dias Creek on Saturday March 23, 2013. Last year on July 11, 2012, we raised a total of $2,225.00; we had a lot of support from our volunteers, Steve's Café staff and all of our supporters. We are asking for your thoughtful and generous donation of items which we can use during our event. Some items which may be donated but not limited to are : Spaghetti, Sauce, Meatballs, Salad materials, Take out containers, Water, Soda, Cups, Plates, napkins, dessert items or Gift certificates. Once again any donation given is tax deductible and would allow us to make our event a huge success. 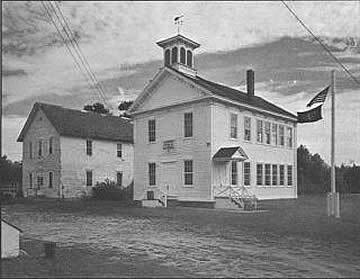 Built in 1872, the Goshen schoolhouse was used as a school through 1961 for many local residents. In the late 1960's, it was sold for a dollar to the Goshen Volunteer Fire Department so that the fire department had collateral for its first fire truck. The Save the Goshen School House Committee, created in January of 2012, and the Goshen Fire Department are currently writing a grant for $30,000 in order to do a study on the complete history and background of Goshen. There is a rich history behind this rural community that should not be forgotten. It was once slated to be the county seat, as it was a popular industrial ship building area. This grant will also gauge the structural improvements needed to restore the school house. The committee and Fire Co. need a $10,000 cash match for the grant. This match has been guaranteed through the Fire Commissioners Capital Improvement Fund and will be paid back to the fund, at no cost to tax payers, once the $10,000 is raised through private donations and fundraisers. This grant is needed to enable the Fire Department to apply for the two other grants. One from the Historic Trust Fund of New Jersey for up to $350,000 and one from the DCA for up to $350,000 . These two grants will be used to restore the building to back to its original splendor. The restoration will be home to a small museum that will tell the history of Goshen, provide much needed meeting rooms and educational space for the fire department and the downstairs area will be used for community events and fundraising efforts. This project is not just to benefit the town of Goshen but could be a pride and joy for the Township of Middle and the whole lower end of Cape May County. This school sits right on route 47 which is part of the New Jersey Heritage Trail and is one of the first towns, in Middle Township, that a visitor travels through to get to their vacation destination. Also we believe it to be the only two story wooden structured school house left in Cape May County. All donations all welcome. Please send donations to Sturdy Savings Bank in Cape May Court House, Made out to: Goshen School House or contact David Ennis, Chairman, 609-602-4515. 4th Wednesday of the month - 7:00 p.m.